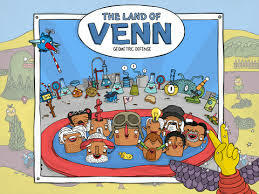 The Land of Venn is under attack, and in this game you are their only hope!!!! You are the only one who can save the Land of Venn from utter destruction by the hands of the evil wizard Apeirogon who lives atop the Dark Square Root. Using geometric defenses (straight lines, open shapes, triangles, etc.) you can destroy the Bookenriders and defeat Aperigon. This is a wonderfully creative, highly educational, all around wacky fun app that is made for ages 4-10… but can be challenging for any age. The Land of Venn – an educational math platform that simulates the way children initially learn from parents; by imitation, play and conversation, as opposed to “frontal” teaching, with “one-dimensional” challenges and practice without context. It stimulates a child’s natural learning mechanism: imitation, repeated experimentation, play and visual feedback processing, coupled with concrete and complex sounds that accompany each of the 11 levels, all the while guided by a Wizard Worm. Throughout the 30 different levels, children will learn the language and mathematical concepts relevant for ages 4 to 10 including points, square and feature sets, and hierarchical relationships. • An adaptive learning system aimed to support meaningful learning process. iMagine Machine is committed to helping children, parents, and teachers achieve better learning experiences through their applications. Tremendous amount of thought and planning goes into every one of their products. They are a gaming studio that develops STEAM — (Science, Technology, Engineering, Art, Math) related games, with an emphasis first and foremost on the gaming experience, weaving in the pedagogy transparently.